Crank it up. Suspend what is dull and indifferent. Kickback and unwind to the refrain, “do what you love, do what you love, #dwyl”. Pardon me, while I peddle some positivity – but first a break for science. A fixed mindset and the person who sees things in black and white (aka the perfectionist) leads to an intense fear of failure. DWYL is not a directive on self-improvement. It’s not a career path mantra. It’s an inside game that moves us through the world of pleasure and muck with a heart first attitude that inspires the likes of kindness, fulfillment, interest and attraction. Interest and attraction makes things flow — yup, our generosity spikes, we join forces and listen. The sparks fly, (boom,) we step in, step up, and invest more time, wisdom, attention, and effort. You see, we’re gaining ground and getting closer to the edge that leads to mastery. A path riddled with learning curves and experiments and experiences and false starts and chance wins and earnings and miracles and triumphs. What a gift to the soul. The art of mastery doing its work, teaching us how to look with the other eye, which is so very important to our heart. And LOVE full circle is shaped like a heart. 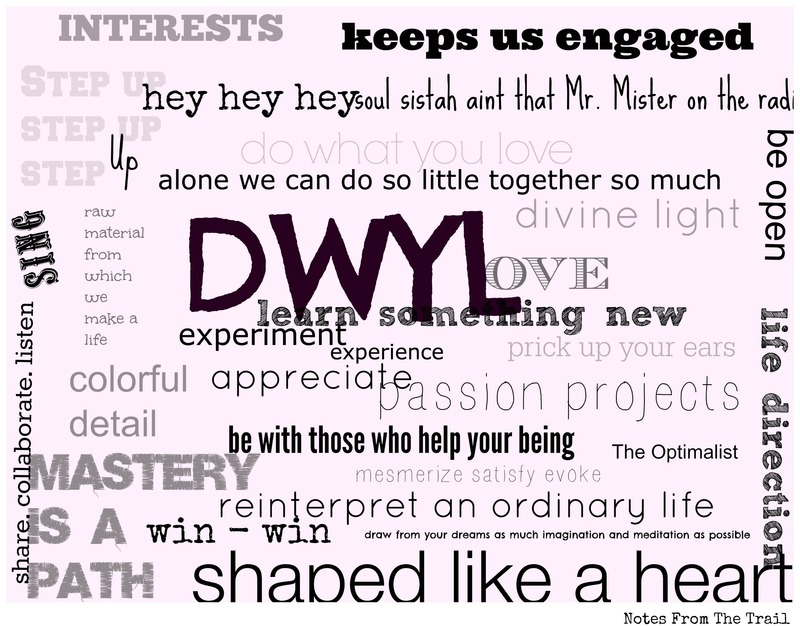 A pounding, purposeful, (can’t-live-with-out-it-ever) heartbeating reminder to do what you love, do what you love, #dwyl. This entry was posted in Essential Dish, Uncategorized and tagged Do what you love, DWYL, fixed mindset, growth mindset, inside game, interest, Janice Hoffmann is a creativity coach, janice hoffmann is a life coach, Love in action, mastery is a path, positive psychology. Bookmark the permalink.